Lots of jobs in the HR industry involve working at a desk and using a computer for long periods of time, five days a week. People who spend most of their day sitting have a greater risk of facing health problems including obesity, back problems, eye and sight complaints and headaches. A scary thought. So how can you do your job and maintain a healthy lifestyle? We delve a little deeper. 1. Stay hydrated – Even just mild dehydration can cause moodiness and fatigue and busy schedules can make it easy to forget to drink as much as we should. However, staying hydrated helps to improve productivity, concentration, and performance both mentally and physically! Try to start your day with a glass of water, carry a bottle with you at all times and make a conscious effort to stay hydrated throughout the day. 2. Walk to work – in order to keep fit, it is recommended that we do 10,000 steps per day. This can be hard if your job is office and desk based so it’s important to think of ways you can increase. Walking or cycling to work is a great way to start the day as it gives you time to gather your thoughts, take in your surroundings and not to mention it’s free. A study by the London School of Economics showed that people who walk briskly for more than 30 minutes a day were found to have lower BMIs and smaller waists than those who didn’t. An easy way to keep both the mind and body healthy. 3. Prepare your lunch – offices can be notorious for bad eating habits and unhealthy food choices. Most workers are busy and want convenience which when buying your lunch on the day increases the chances of opting for unhealthy choices. Preparing and bringing your own lunch is not only healthier for your mind and body but also for your budget! It doesn’t have to be difficult either, batch cook and freeze or make bigger portions of your evening meal to bring in the next day. To think about the financials, it is reported to cost an average of £1.50 per day to prepare your own lunch compared to a whopping £7.81 per day to buy it. Over a month that’s a difference of £126.20! 4. Take a lunch break – speaking of lunch, avoid eating it at your desk. Only a third of UK workers say they take a proper lunch break, with many citing workload, stress levels and workplace culture as barriers. 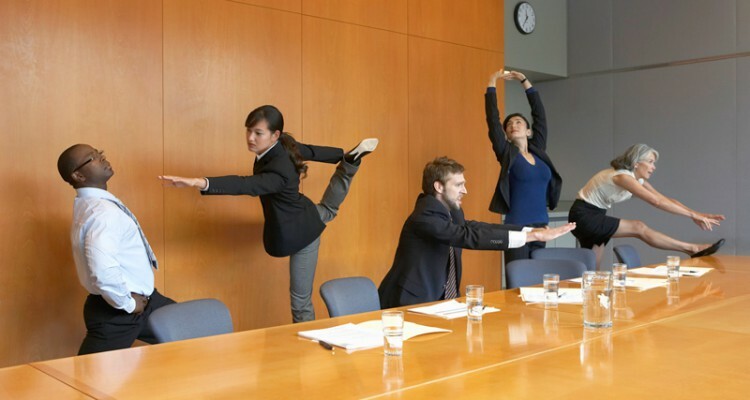 However, even having a short break away from your desk can have numerous benefits on your mental and physical health. Studies show that allowing your brain to rest and recharge directly improves your productivity for the rest of the day. 5. Move whenever you can – Are you guilty of emailing and phoning a colleague who is sat in the same room as you? ditch the devices whenever possible, walk to their desk and tell them directly! This will give you a break from your screen and help you to get your steps in. small changes including taking the stairs over the lift where possible will also add up throughout the day. 6. Ensure you get a good night’s sleep – sleep is essential to a healthy life. It affects your life span, attention and memory, stress levels, your skin and even your weight. Sleep is your body’s time to recharge so if you’re not getting enough of it, you’re already starting the day at a disadvantage. Adults need at least 7 hours of sleep so make the effort to implement a healthy sleep routine. There are various free apps which can also help you monitor your sleeping patterns. Give yourself the opportunity to wake up feeling fresh and ready to attack the day! 7. Exercise regularly – exercise is fundamental part of living a healthy lifestyle and also improves your mood and reduces stress. Schedule time to exercise in the evenings or weekends and make it enjoyable by trying different things. Exercising not only keeps you fit and healthy, it also acts as a stress reliever, boosts your endorphins and can improve your sleep. If you need motivation to exercise get a friend involved so you can encourage each other. 8. Have a positive attitude – there is no doubt that you will encounter stresses and challenges at work, but your attitude will define the way you deal with this. Thinking and acting positively is not essential for your own happiness, it will have a positive impact on the mood of your colleagues. It is also thought that those who are enthusiastic, manage stress and are prepared to help others are more likely to be recognised for promotion. By making some small changes, you will notice a difference in your health and well-being. Today, many employers make a conscious effort to prioritise the health of their work force so why not make suggestions to encourage workplace schemes such as free fruit, lunchtime meditation or exercise classes and providing a secure place to store a bike to encourage people to cycle to work. Looking for more HR advice? Click here. How HR can help to break the taboo around mental health in the workplace?